"It's not the truth that matters, but victory." "And the victor will never be asked if he told the truth." It is from a slightly older novel, Pat Miller's Willfully Ignorant from 2014. In the first place, it shows that, despite the obsession with Adolf Hitler in popular culture, much of the general public knows practically nothing about him. They never perused Mein Kampf to get a general idea of what Hitler said -- which is rather the opposite of what is attributed to him here. The whole spirit of Mein Kampf is blunt and honest. Furthermore, it suggests that they are still under the influence of old war-propaganda alleging that Hitler presented in Mein Kampf theories about how to deceive the public. Anyone who investigates what Hitler wrote will find that he warned against the Big Lie as a tactic of the Jews. But the vast majority of people will never check, and the few who have checked either could not or would not obliterate the false belief. The belief that Hitler would have written such statements in a book for publication also shows an utter lack of critical thinking. The statement shown here resembles something from The Protocols of the Learned Elders of Zion, which was alleged to be a secret document that ended up being published only because it was leaked. * There is no similar background story to explain how similar admissions from Hitler could become public. 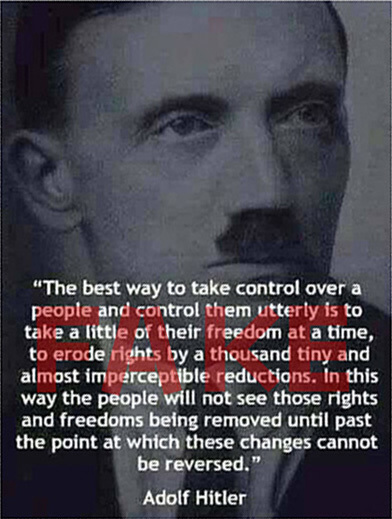 We are supposed to believe that Hitler deliberately wrote down his evil intentions and had them published. People are just not thinking. Here is a statement by an author who is counting on an unthinking public when he makes bald, insupportable and absolutistic utterances from a post-war culture replete with received ideas. Mein Kampf is the book that everybody pretends to have read, just so that they can dismiss it. Tabori talks as if he hasn't read it either. It is possible to make some criticisms of the style of Hitler's writing, but to call what he wrote nonsense is absurd. H.L. Mencken actually wrote a review of Mein Kampf, and he said that there were no NEW ideas in the book. In a way, that's an endorsement. If Hitler was assembling commonplace ideas, then he was certainly not writing nonsense. Mussolini made some very striking statements. Here's one: "Fascism sees in the world not only those superficial, material aspects in which man appears as an individual, standing by himself, self-centered, subject to natural law which instinctively urges him toward a life of selfish momentary pleasure; it sees not only the individual but the nation and the country; individuals and generations bound together by a moral law, with common traditions and a mission which, suppressing the instinct for life confined in a brief cycle of pleasure, builds up a higher life, founded on duty, a life free from the limitations of time and space, in which the individual, by self-sacrifice, the renunciation of self-interest, by death itself, can achieve that purely spiritual existence in which his value as a man consists." About Stalin, I don't know. But somebody must have found him compelling. "Tabori talks as if he hasn't read [Mein Kampf] either." I agree. That's why I wanted to quote him as an example of the kind of unthinking stupidity that sounds off as critical intelligence when it comes to Hitler. That quote you gave from Mussolini is excellent. There's a similarity here to the Third Reich's political philosophy in that quotation. No wonder Ezra Pound and Hitler were enamored of him -- at least in the beginning. About Stalin -- you don't know? I think you were enjoying being funny here: "somebody must have found him compelling."